With our release today, all Hoop.la sites now support two-factor authentication (2FA), which allows community members to improve the security of their accounts. Hoop.la uses Google Authenticator for 2FA, which can be accessed via the Google Authenticator mobile app on iOS or Android. Note that 2FA can be optional or required. Password Length: to further increase security, we now require that account passwords be at least 8 characters long (previously, the minimum was 6). Note that existing users will not be forced to change their passwords, however. The new minimum will apply when users try to change their passwords. New Registration Invitation Setting: we added a new registration setting (see below) that, if enabled, allows admins to moderate registrations that were created based on invited by admins. This is useful for sites that want to review all registrations, even ones invited by admins. Note, however, that you would still need to have a recipe to handle registration moderation in the first place. Forum Category Intro: we've aded support for a new Category Intro field for forum categories. 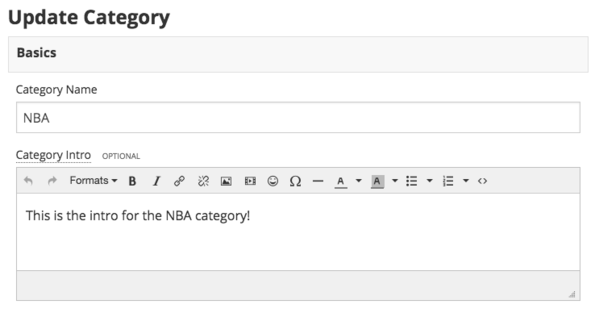 Whatever text you apply here will be displayed at the top of the category's forum directory page and topic list page. There were other minor improvements and bug fixes in this release, as well. If you have any questions, please post to our support site.